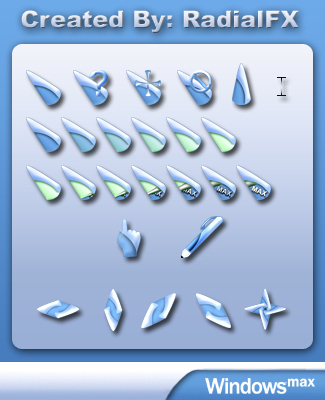 Cursors made to go with Xero's fabulous WindowsMAX skin Link Special thanks to Xero for giving me permission to use the name and also for having enough confidence in me to make them. Thanks Xero! I hope you like them. Enjoy! I updated this set by making it match Xero's great WindowBlinds skin better. I changed the animation on the Working cursor and I THINK it looks better. In particular I made the hand a smaller and slimmer, the help, Precision Select, Pen, Unavailable and the Text Bar. I hope you like them. My hats off to both of you. They both compliment each other. Your cursor is one of the cleanest I've seen. I love the work, and the animation. This is beautiful, Rad! Very clean and original and ya know what? Every time you make a new cursor I'm excited all over again by your artistry and imagination. Another ten from Angel_Wings ! You guys all came out of the gate with TOP NOTCH material! You guys make me so happy! Again, thank all of you very much! A small dissappointment -- I thought there would be animation with regular pointer . . not so though. Having to wait for "working" status was a letdown. Oh well. YES! anotha stylish, excellent cursor!! This is good! This cursor also looks great with Corona XP. Very nice. Awesome colors, great details, with a few words, very beautiful cursors!! yep, that was the style that we had in mind when me and RadialFX talked about them.